For 1 pound of crab meat, I use 8 saltine crackers. Place the crackers into a small sandwich bag and crush them with your hands or the back of a spoon. Into a big bowl with the crab meat, add the lineup of: cracker crumbs, an egg, 2 1/2 tablespoons mayonnaise, a couple teaspoons of lemon juice, Worcestershire sauce, a dash of hot sauce, and some salt and pepper. I also like to toss in some chopped parsley for just a little color. Again, feel free to add some other spices you like. Shape them to a size you like. You can make 4 large ones for a main course or do like I did here and shape them into 12 mini crab cakes. I like to prep the crab cakes, then wrap them up with plastic wrap and let them firm up in the fridge a bit. When you're ready to cook, simply heat them in a skillet with some oil. Cook until they crab cakes are golden brown and heated through, which takes only about 4-5 minutes on each side. I use a large, 12-inch nonstick skillet and cook the dozen mini crab cakes in a single batch. 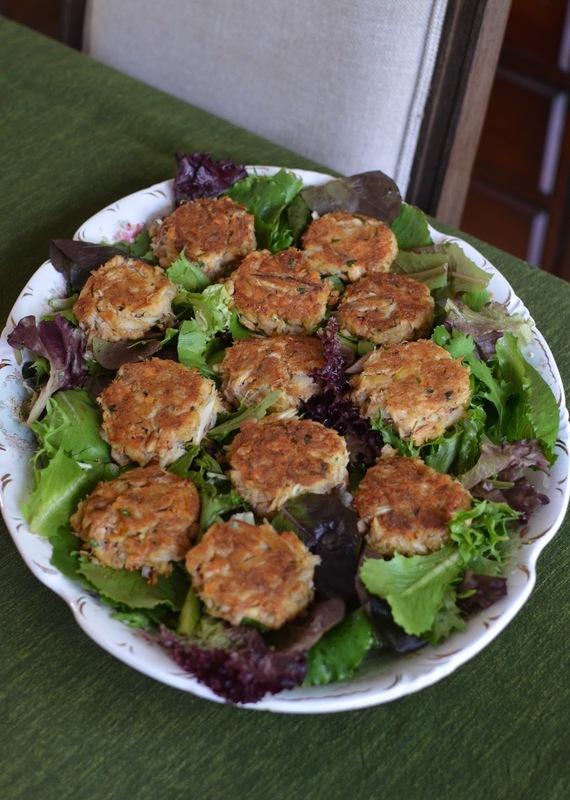 Place crab cakes on a bed of lightly dressed greens or just serve them with some tartar sauce. However you do it, they're certain to go fast! In a large bowl, gently mix the crab meat, cracker crumbs, egg, mayonnaise, lemon juice, Worcestershire sauce, hot sauce, parsley, salt and pepper together (I use a fork). Form the mixture into 4 large crab cakes, or 12 mini crab cakes. You can prep the crab cakes in advance; place them on a plate, wrap in plastic wrap and refrigerate until ready to cook (the crab cakes will also firm up and make them a bit easier to handle when cooking). Heat oil in a skillet over medium-heat. Place crab cakes into the pan and cook until golden brown and cooked through, about 4-5 minutes on each side (I find it helps to use two spatulas for flipping the crab cakes). Drain crab cakes on paper towels, then plate and serve, with tartar sauce, if desired. Crab cakes are so popular here in Virginia and I must admit, I've never made them. I have however, eaten plenty of great crab cakes. I'm going to try yours because I am also intrigued by the crackers. What a lovely way to serve them and I think the smaller size is great. Thank you so much for sharing this recipe! Have a great weekend Monica! Must be because there are so many places to get good crab cakes near you that you haven't made them yourself. It's so easy - one of those dishes that relies on a major good ingredient. I'm glad this might inspire you to make it because I know you would make some crazy-good crab cakes if so inclined! I miss crab meat! These look great. Love the saffron rice in the background too, Monica. Thanks and the very same to you! That's too bad! The big chunky bites of crab meat is so good. Have a great weekend! I don't eat crabs but my husband loves crab cakes but I have never made them for him. I think I should try my hands as your recipes sounds awesome and doable. I am sure he will love these. Have a lovely weekend. Thanks, Anu. Enjoy the weekend! I love how they are crispy on the outside and moist on the inside. This recipe is also good with you know those crackers garlic chives Pan Pan crackers Garden brand from HK... LOL I swear I was addicted to those cracker and now of course cannot find them anywhere here. I totally LOVE those crackers!! I loved them as a kid and I remember buying a box a couple years ago to share with my son and I was thinking "wow, they're strong!" So good though...and I am pretty sure they are still stocked in local Asian markets here. Where are you located now, Bobbi? Crab cakes are a favorite around here so I know these would be gone in no time at our house! The saltine crackers sound like such a great addition too! Oooh and I think I catch a peak of the yummy lemon saffron!! What a perfect meal for any occasion! Oh boy...I'm sure those crab cakes are divine. It's fun to be able to make them at home but crab cakes are definitely something to order when you see them on a menu. Crab cakes are one of our family favorites, love how this recipe celebrates the crab, perfection Monica! Just crab and a lot of seasoning but not a lot of fillers. Hope you're having a good weekend! 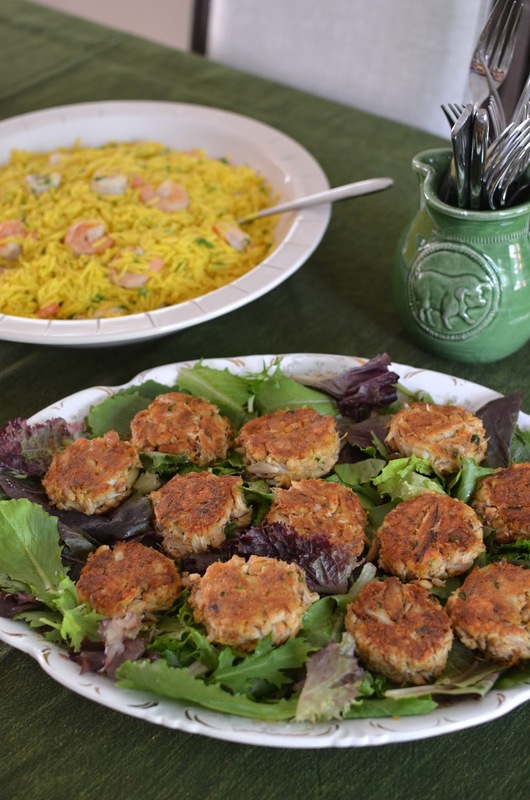 I love crab cakes, but never make them because of my husband's allergy to shellfish. If I'm going to dinner with my girlfriends, that's the time I eat them! Your recipe looks terrific. Thank you for sharing such a lovely recipe. Looks amazing! I adore crab cake, but I've never made them. Yours look exquisite, I am quite intrigued by the crackers.... And I love the way you serve them. Thank you so much for sharing this recipe! Have a great weekend ahead, Monica. Thank you! And your post was lovely and a great reminder to treat yourself. I feel lucky that I have a lot of time to do things for myself but I will for sure put more care and thought into it.